Sarah at Small World wants to hear Our Story. (Actually, she wants to hear everyone's story, but I can only tell ours.) If only I could tell a compelling love story like Ree. But I doubt you would want ours to go on for months and months, even if I could think of (or be willing to share) enough details. I'll try for more details than 'we met at the pool, later started dating, and then got married,' but fewer than 50 chapters worth. I won't torture you and drag this on, so I'll post the whole story here. Feel free to skip or skim. Although Sarah is hosting a contest, I have automatically disqualified my entry on the basis of photographs. She wants goofy, embarrassingly silly wedding photos. I don't do publicly embarrassing. Or steamy. Or romantic even. Besides, the pictures of our wedding aren't embarrassing (yet), just not spectacular (somewhat blah, actually). February is a perfect time for relationship reflection, particularly for Russ and me. Our twelfth anniversary occurs just ten days after Valentine's Day. Almost thirteen years ago, I thought I was an old maid at the distressing age of twenty one. My best friend and I had no plans for another exciting Friday evening. Her parents were heading over to the local pool to test out their scuba diving equipment before heading out on vacation. My friend was going along to help. When she realized that she would be sitting alone with nothing to do, she invited me. We sat at the edge of the pool, our toes in the water, gossiping about the pool manager who had nothing better to do than practice his diving. (What guy wouldn't want to practice his diving with the undivided attention of two beautiful girls?) The little my friend knew about his background fascinated me. This was a guy who had intelligence, ambition, and was able to pull himself out of a rough childhood. And he had great legs. Very few guys have great looking legs. I knew that I could probably arrange to be set up, but I was so very tired of blind (or set-up) dates. I hated dating. Really. I disliked going out with someone I was uncomfortable around and painfully attempting small talk for an entire evening. I would rather be home in sweats, watching a movie or reading a book. It is tough being an introvert. No wonder I was an old maid. Two months later, my friend, Char, was at the coast with her family and their close friends. I was aware that Char was becoming very close to their friend's son. He happened to be best friends with Russ. She called up out of the blue that Thursday. 'Get ready. Two young gentlemen are taking us out for dinner and a movie. Be at my house in an hour.' Yes, thanks for giving me time to be mentally prepared. We went to a cozy local seafood restaurant. Russ drove the four of us. We had a nice, uneventful dinner, then headed to see While You Were Sleeping with Sandra Bullock. I had already watched it, but it was a good clean date movie. And no surprises. I don't do surprises. After the movie, we headed to a park to chat. Char and John went for a walk. Russ told me that he was teaching with a degree in biology and read sci-fi books. A science teacher? I hated science. Teaching was dull. Sci-fi books? Just about the only thing I didn't read. And he loved swimming. I wasn't sure I could swim from one end of the pool to the other. I began to think this wasn't going to work. The next day I was at Char's house when he called for my phone number. Char ignored my pleading and frantically waving arms (No, oh, please, don't tell him I'm here!) and handed me the phone. He asked me if I would like to go out the next evening. Not really. 'Sure.' It was settled. He picked me up. It was Saturday evening. I had told him that I did a little line dancing. (Do I have to admit that?) This was back during the height of the line dancing phenomenon. So we went to a western dancing thing. I don't even remember much about the date, other than wanting to crawl in a hole. Way too much for this introvert. During the course of the evening, he asked if I was going to church the next morning. Yes. What time? Do I have to answer that? My mom is vaguely remembering an old conversation about the man I was going to marry. She decides to invite Russ to dinner. Without asking me. Thank you mother. I'll just cancel my other plans. We lived through dinner. My dad had just woken up. He was working a security job and had been up most of the night. He looked very confused. I thought I might get a few days off. The phone rang Monday evening. Russ asked if I would join him for a walk. Why not. We enjoyed the walk and engaged in conversation. Real conversation. With a guy. This was getting interesting. He was leaving in just three weeks for the summer, hours away in the middle of nowhere to manage a swimming pool and coach a swim team. This might be perfect, I thought. Enjoy dating someone for three weeks and then have an easy out. Things were spicing up. I was sorry to see him drive off. Tuesday evening, I was again hanging out at my friend's house. (We spent a lot of time together.) We giggled and talked about 'the boys.' Things were spicing up for her as well. Her phone rang. It was Russ. He asked if I was there. How did he know? Look out the window. Oh, he is in the driveway. This was back in the day when only the 'cool' people had cell phones. I was certainly impressed. We talked a bit. I told him I had to have a night off to do laundry. He reluctantly agreed, but we made plans to attend a concert on Thursday. I managed to get my laundry done, and we headed out to the concert Thursday evening. I don't remember much about the evening except that my car broke down. I hated when my car broke down. Russ said he would take care of it and drove me home. Wait! A guy to take care of things like that? I could get used to this. I almost forgot, I met his 'adopted parents' (long story) that evening. They were the kindest people. I hoped they liked me. I think Russ cooked dinner. We were invited to spend the weekend over at the coast vacationing with Char's family. We left on Friday afternoon. Russ drove. We had an incredible weekend. Saturday afternoon I was feeling disgusting. We had been out on the beach. I felt sticky and wind-blown, no make-up, my hair was in knots, my cloths dirty, and I had a gash on my leg. Russ told me that I looked beautiful. He meant it. I was starting to really like this guy. Russ picked me up from work every day the next week. He had gotten my car into the shop where it was being repaired. He cooked dinner for me and then drove me home. Two weeks. We had been together every day (except for one laundry Wednesday). We were simply comfortable together. Perfect together. I warned him that I was planning on homeschooling my children some day. He didn't run. He bought me a simple ring. I think we had been dating three weeks. He was heading out of town for the summer. I was going to miss him. Greatly. How did that happen? Time was a blur. Five weeks into the relationship. We were trying to see each other whenever possible. He had swim meets all over the state. If he was less than three hours away, he would visit. We talked about marriage. I traveled with my little sister to visit him. We looked at ring catalogs. We racked up huge phone bills. We wrote letters. He would send me the funniest faxes at work. We were perfect for each other. We loved being together. We never fought. I brought stability and hope to his life. He brought adventure and delightful chaos to mine. Three months after our first date, Russ came back to town. We were officially engaged. He was taking a job on the coast, two and a half hours away. My family knew that I must really like him. I never wanted to live on the coast. I was marrying a science teacher and moving to the coast. We had six months to plan our wedding. Mom and Shannon did most of the work. I was tired. Too many late nights on the phone. A couple jobs. Russ and I spent every possible moment on weekends together. I ended up with mono. I felt like I was half dead. Luckily there was a light at the end of the tunnel. Char and John were married in December. We had the privilege of being their maid of honor and best man. They returned the favor the following February. I was still twenty one. Russ was twenty five. The wedding was lovely thanks to my mom and Shannon. They worked so hard, along with so many friends and family. I can't believe all the work they did! 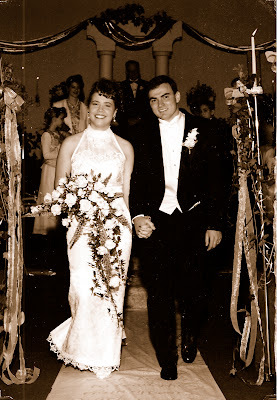 My mother sewed my wedding dress, cooked food, decorated, and worked herself to a frazzle. Shannon was the master-planner and handled a huge amount of the decorating. Dad built the pillars we used as a backdrop on the platform. A friend did most of the work on my wedding cake. I helped decorate it. We spent a few days in the snow. I learned that I am a terrible skier but not bad at ice skating. Russ had to get back to teaching and coaching. I joined him at the adorable little beach house he was staying at. Twelve years later, we have three amazing little boys and live in our forever house in the country. Russ has changed careers and become a computer guy. He is teaching our boys science. I have learned to like Stargate SG1. We are still in love and life is good. still live in blisses bright and real. Small World~ Thanks for the fun contest. I appreciated the incentive to remember our story and get it written down for posterity. :) Thanks for the coolness points, LOL. Oh, I love this story, Heidi! Sweet story, Heidi. In our times, your strong commitment to one another is a rare thing. Love the story of your first few dates. So funny how love sneaks up on us! I am a literature/history lover who married a science guy, too. He spreads wonder into my mind that I never would have cared for. Happy Valentine's day and anniversary! Even introverts can find true love ... especially with a guy who cares enough to be persistent. Loved your story! What a lovely story! Your wedding photos are beautiful. My husband and I were married when we were 21 and 22. (But we met in the library--and now my husband is a librarian!) We'll be celebrating our 11th anniversary in May. Thanks everyone! I really do feel blessed with my husband in my life. We are a perfect match! I'm glad you still love him. Even though he drives you nuts, stays up too late at night, and has all of those other idiosyncrasies. He loves you to. Very Much. I'm almost inspired to perhaps share mine - if only I could grab enough time to actually compose and post something for my blog! Plus most of my readership has already heard the story (or lived it (my sisters)). I love your dress. It's beautiful. What was the back of it like? What a sweet and beautiful story! Carole~ You should write out your story! It is fun to have a reason to think back about the details and have them written down. I know about finding time, though. It took a lot for me to get around to it, think about our story, and get it written! Flo~ Nice to see ya! Aren't love stories fun - each unique for so many similarities. I love your pictures too. I also love the poem down the aisle. You have such creative ideas - you and your entire family. 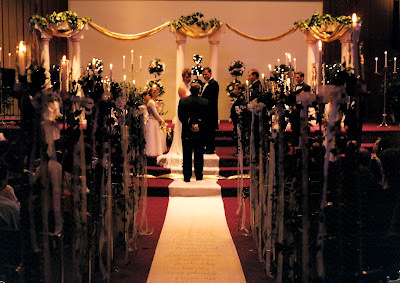 I'm a big poetry lover, (as is my husband--he proposed by reciting poetry to me) and I adore the idea of having a poem on the runner up the aisle. Maybe we can get married all over again so we can copy you! I also love a good poetry challenge, so I did a little web searching to find the source of your poem, but no luck. I've also looked in a couple of old poetry collections I have, but again found nothing. I will keep my eyes and ears open though, and if I ever find the entire poem, I'll let you know. I Was Just Thinking~ Thanks! I enjoy reading the stories of others as well. Jen~ Thank you so much for looking into that for me. I've been thinking about were I initially found the poem. I think it was in a Victoria magazine. It was an article... maybe about a calligrapher, and that poem was written on a piece of paper. It was a long time ago, and I don't think that helps much.